I belong to several forums on the Internet, dedicated to Medieval history. One of the questions that arises on a regular basis concerns knightly effigies and what their poses mean with particular reference to those that have crossed legs. If I had a pound for every time someone has replied to the query with 'It shows they went on crusade,' I could have retired on the proceeds by now. Another favourite is that if they are shown drawing a sword, then it's because they died in battle. If there's no shield they didn't die in battle. If the arm is crossed over but he lacks a sword, then he died in battle but using his fists. His crossed legs show that he's been castrated by a Saracen! Or, crossed legs at the ankle equals one crusade. Crossed at the knee and it's two. It sounds rather like a game of Effigy Top Trumps doesn't it! (a card game detailing the properties of objects whereby one wins points by having the best statistics). These discussions and the constant repetition of the notion that crossed legs on knightly effigies meant that the men had been crusaders led me to wonder where the ideas originated and if there was any truth in it. When asked for sources people usually don't know. 'I read it somewhere,' they say, or 'somebody told me.' I set out to do a bit of sleuthing. The connection of cross-legged effigies to crusading is still alive in the mainstream as proven by the constant iteration on the above mentioned forums. It seems that many church guide books, internet and heritage sites offer the information as fact. For example, Brewer's Dictionary of Phrase and Fable, the 2009 edition states that 'crusaders were generally represented on the their tombs with crossed legs.' Stephen Friar's Companion Guide contains similar information. 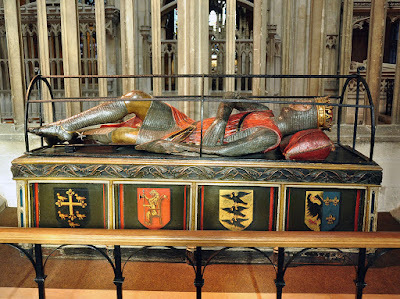 However, the idea that the crossed legs of knightly effigies of the medieval period have symbolic meaning connected with warfare or the crusades is not unanimous and there are also guidebooks and websites that do not subscribe to the theory. Frank Bottomley in his 'Church Explorer's Guide' informs the reader that effigies with crossed legs have nothing to do with crusading. So different information is available depending on where the reader looks. So, having sorted out that a variety of information exists in modern publication, I decided to rewind a few centuries and see where the crossed legged crusader began. First to the effigies themselves. The cross-legged attitude in tomb sculpture was the height of fashion throughout the British Isles between the mid 13th and mid 14th centuries. Indeed, the majority of military effigies were posed this way and it became a kind of cliche. There were different poses within the fashion. There were those whose hands were placed in restful positions and they tend to belong to the early part of the epoch. Then there were the knights who were handling their swords - either drawing them or sheathing them. The upper body action combined with the crossed legs made for an active, lively effigy appearing to be in motion rather than at rest. The third batch had hands are clasped in prayer and these were to eventually supersede the action knights. The legs too, after the main period were gradually to straighten out once more. This may have shown French influence because French effigies of the period generally depict hands in prayer and legs parallel. Another reason for the return of the straight-legged pose may have been the development of plate armour - it looks better on straight legs! There is also the matter of technical development as sculpting techniques improved and styles changed. The early 13th century effigies show stiff, straight legs without any bending of the knee and without undercutting. As the century advanced, the knees were bent more and more and the effigies came to look more naturalistic and more realistically rendered. So now let's leave these knights to the vagaries of time for a few hundred years and see what happens when antiquarians start to become interested in them. The first observations in the mid to late 16th century note that the effigies are 'old' 'ancient', 'antiquated' and 'venerable' etc. These terms are applied more to cross-legged effigies than straight ones, and it would appear that the antiquarians knew their older knights from those nearer to their own time. In 1587 the poet Thomas Churchyard described the late 13th century wooden effigy of Reginald de Briouze at Brecon as 'Cross-legged...as was the ancient trade.' There was even a popular belief for a time that these cross-legged effigies dated to before the Norman Conquest, such was the shaky grasp of timeline. By the 17th century, however, that particular idea had died out. Allied to this developing interest in all things of the forgotten past, the historical detectives of their day began examining the tombs of the 12th and 13th centuries and attempting identification, often on very unreliable evidence or completely misunderstanding their physical source material. So for example, Sir Henry Sidney brought a 14th century wooden effigy twenty five miles from Drogheda to Christ Church Dublin and had it installed as 'Richard Strongbow' Earl of Pembroke - who died 1176. In the 1590's John Lord Lumley acquired a 14th century effigy to become the 12th century William de Lumley, founder of the dynasty. There also seems to have been a particular interest in the 16th century for either altering real medieval effigies to represent one's ancestors or having fake ones made and giving them crossed legs. Southwark Cathedral wooden effigy. Possibly a de Warenne. Late 13th century. Relaxed pose. One William Wyrely writing in 1597 may be the man unwittingly responsible for the notion of crossed legs being a crusader image on effigies. While refuting notions that the cross-legged effigies were pre-Norman Conquest, he remarked that such armour was known to have been in use after the 'Palestine Wars.' Within a decade of that statement, Chinese whispers had done their worst and antiquarians were now equating crossed legs on effigies with the conviction that the effigies so portrayed were crusaders or knights who had taken crusading vows. 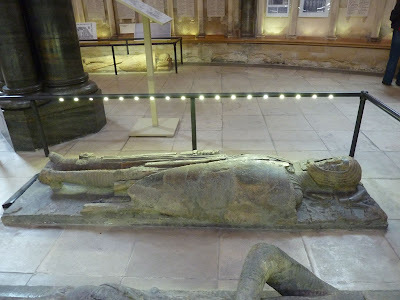 On contributory factor may have been the effigy of Robert Curthose (d.1134) who did go on crusade and has just such an effigy, albeit not created for him until the late 13th century. There was also a detailed interest in the knights of the Temple Church in London. Here the crusading associations were very strong and the Inns of Court surrounding the church were hotbeds of inquisitive antiquarians. The first reference, linking cross-legged effigies with being crusaders comes from William Camden in 1594, in the fourth edition of his work Brittannia. "Many noblemen were buried among them, whose images are to be seen in the Temple with their legs transverse in a cross; for I have heard, so all were buried in that age, who had pledged themselves to the Holy War, or who, (as was then said) had taken the cross." effigy. He DID go on pilgrimage but his legs are straight. Note Camden says 'I have heard'. So even then people were 'hearing it somewhere'! He would have known that Gilbert Marshal, in possession of crossed legs on his effigy, had taken crusading vows, although had not fulfilled them. Four years later, John Stow in his 'Survey of London' was straightforward and stated without equivocation that the men with cross-legged effigies were all vowed to the Holy Land and that the straight-legged ones weren't crusaders. He also said that of course these were post Conquest effigies because of the period of the First Crusade (1095) and that there would be no cross legged effigies after the suppression of the Templars in 1310. So he nailed his flag to the mast and used the cross-legged effigies as his dateline. Throughout the 17th century other antiquarians jumped on the bandwagon and the idea entered popular culture and entrenched itself. It's been there ever since. There was a theory among many of the antiquarians that cross-legged effigies had to be Templars, but this was debated and eventually fell from favour. However, in the course of the argument the leading antiquarians of the day concluded that the cross-legged effigies were 'intended to preserve the memory of such persons as had either actually been in Palestine during the rage of what was called the Holy War, or of such who had vowed to go hither....and some perhaps for persons who had made pilgrimages thither merely out of private devotion.' - Smart Lethieullier 1744. 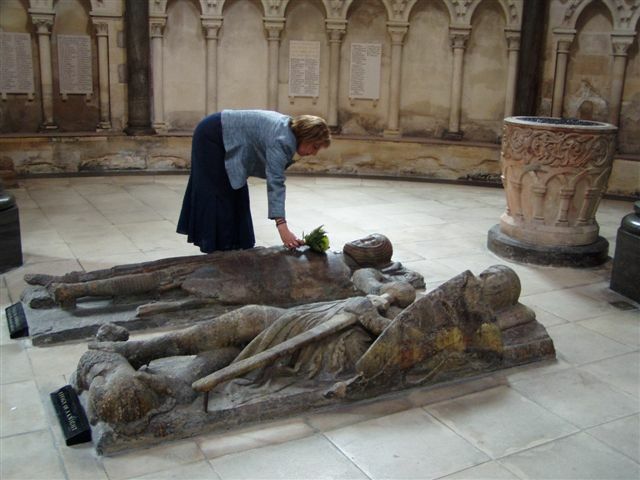 By the end of the 18th century, tombs with crossed leg effigies were now viewed as being representative of someone who had taken a crusader's vow and that this vow then entitled them to have crossed legs on their effigy. The same with donations. If a person had donated to the crusading cause in their lifetime, then they too were entitled to that kind of tomb sculpture. New twists on the theory were emerging (the aforementioned 'Top Trumps' syndrome). Where the legs were crossed had symbolic meaning as to the number of times the knight in question had been on crusade. Score one for ankles, two for shins, three for thighs! A letter to The Gentleman's Magazine of 1789 declared that there were three different positions. Hands in prayer with the sword sheathed, drawing the sword and returning the sword to the sheath. These meant that either the knight had died in peace at home after a crusade, had died in holy war, or who had died on the way home. "Sometimes the figure on the tomb of a knight has his legs crossed at the ankles, this meant that the knight went on crusade. If the legs re crossed at the knees he went twice; if at the thighs he went three times." ' Ditchfield: Our Villages 1889. Gradually, among academia, it became generally accepted that such attribution was indeed a 'fanciful idea'. However, among the public at large, the notion of the cross-legged effigy as crusader remained entrenched. It was far too romantic to give up. Wordsworth, Dickens and Tennyson all made allusions. In 1923, the crossed-leg crusader theory was condemned by A.S. E. Ackermann in his handbook of 'Popular Fallacies.' However, it continues to be a 'popular fallacy' even if not as universally promoted as in the mid 17th to mid 18th centuries. 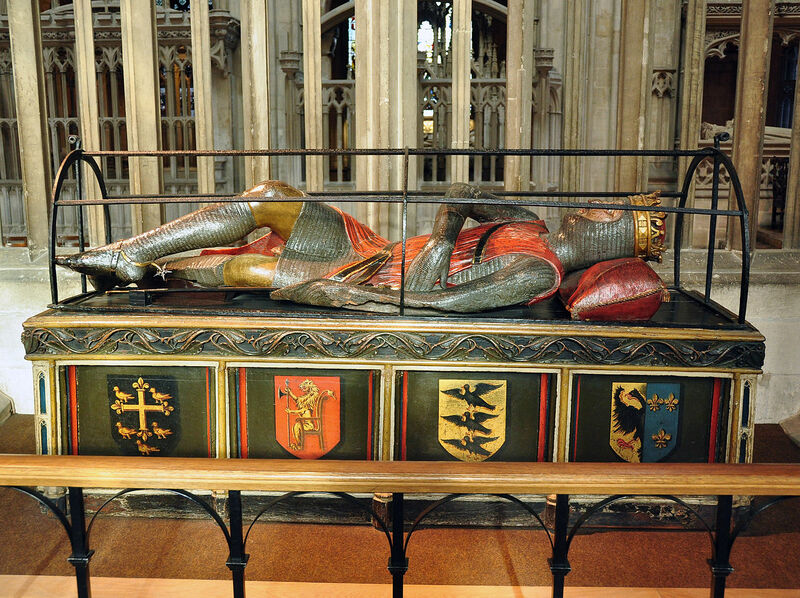 The bottom line is that while some of the knights represented by effigies with crossed legs did take crusader vows or visit the Holy Land, they are only a proportion of the whole represented and this type of effigy is one that developed from the mid 13th to the mid 14th century as a stylistic form and is of its time. The entire crossed legs business was invented in the 16th century and has been tangling historical truth ever since! Antiquarian Attitudes: Crossed Legs, Crusaders, And the Evolution of an Ida by Oliver D. Harris - The Antiquaries Journal 90, 2010. Marshal, a crusader, and his non crusader bent-legged son, examples of early and mid period styles. Elizabeth Chadwick is a best selling author of fiction set in the Middle Ages. She is currently at work on Templar Silks, a novel about the time William Marshal spent in the Holy Land and about which he said very little! Thank you for an interesting and educative post. Thank you so much for increasing my very rudimentary knowledge of things medieval. What a smashing post - thank you! Fascinating research particularly the fashion aspects of designs of limb positions. Would castration be a experience to be eternally recorded? A fascinating post. I wonder if that even if it was stylistic did they have crossed leg and straight leg and could your family chose fromatterns! I absolutely loved the photographs . It's very interesting - and good to be enlightened. Most people in this modern day and age take the rise of the Teutonic Knights and the unification of Germany entirely for granted. It seems entirely natural to them that the Order should rise from obscurity to glory, and few are aware of the incredible odds and vast array of forces that opposed them.I liked your blog, Take the time to visit the me and say that the change in design and meniu? Are women ever shown with crossed legs or ankles? Some unbiased research into the History of the Templar Order in Britain ,it's escape from the great purge and the creation / rise of Masonry in the late 14 th century, would go along way to understanding the symbology on these effigies.. I'm not saying this to be rude ,simply that while I am a woman my family are Chartered at Mother Lodge Killwinning and Ediburgh., so I instantly recognize what level the Knights were in the Templar order . Born in Blood, The lost secrets of Freemasonry By John J. Robinson Is a great read , I'm not saying it's right OR wrong but I have yet to know a Mason who doesn't have it in their library ( the writer is NOT a Mason) Templar Knights went into Scotland and joined service there. Robert the Bruce started a " Masonic " lodge in Scotland. Forget conspiracy theories, but actual Masonic history and the historical figures that are known Mason's is fascinating. Women are not excluded from learning about Masonry and its history. Elizabeth, thank you for clarifying what was truly a bog! Great article! It's funny how the sources vary on this but you really showed it could be quite a few things it represents. Thank you. Thanks. Reading The Confession of Brother Haluin by Ellis Peters. There is a reference to an effigy with crossed legs and hand on sword hilt. Implied that he had been on crusade. I was always led to believe that if they had their legs crossed they died in battle and if they were straight they died in their bed.